Microsoft is BEATING Amazon’s cloud revenues. Er, how? 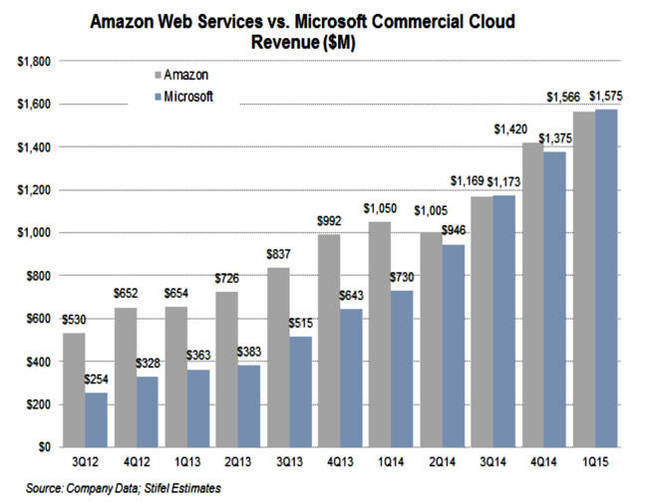 Microsoft’s cloud revenues are beating those of Amazon’s AWS. That’s if analyst-haus Stifel Nicolaus’s data is correct.Back in 2012’s third quarter Microsoft commercial cloud revenue was $254m, with Amazon Web Services (AWS) ahead at $530m. In the first quarter of 2015 AWS revenues totaled $1.566bn, with Microsoft nudging ahead for the first time at $1.575bn. So that’ll be Office 365 and other online services propping up Microsoft’s Azure cloud numbers.